District Messengers were uniformed young men between 10 and 18 years of age who, wearing little pill-box hats and mounted on bicycles, fulfilled urgent tasks or carried telegrams through urban streets and were paid by the mile. This unusual card game, probably dating from the early 1900s, is based on this theme, and clearly embraces the values of capitalist ideology. There are twenty-six cards labelled A, B, C ... Z, plus twelve cards numbered 1, 2, 3 ... 12 each with a short rhyme at the bottom, plus seven additional cards making a total of 45 cards. The game was probably inspired by earlier editions of a board game of the same name published in America by McLoughlin Brothers in the 1880s patterned on the “rags to riches” idea. The images show servile Messenger boys in the streets of London and other places, ever ready to go anywhere and do anything, fulfulling errands and duties for wealthy patrons who are depicted as being of higher social status and worthy to be served. Many of the rhymes refer to the low wages and unfavourable conditions of employment endured stoically by the Messenger boys, as well as their unquestioning sense of duty. The style of clothing, the absence of motorised vehicles as well as a number of the business names or products featured in the artwork, correspond with a date of late 19th or early 20th century. For example: Sloper’s Pills, Dash & Bellamy Fishmonger, V. Benoist 36 Piccadilly, Streeter & Co (1873-1905), Morel Cobbett & Son, Hewetson’s Tottenham Court Road London, Bertram Upholsterers, Simpson & Sons livery outfitters and Dr. Jaeger’s Sanitary Woollen System, which had received its first Royal Warrant by 1910, all operated around the turn of the century. 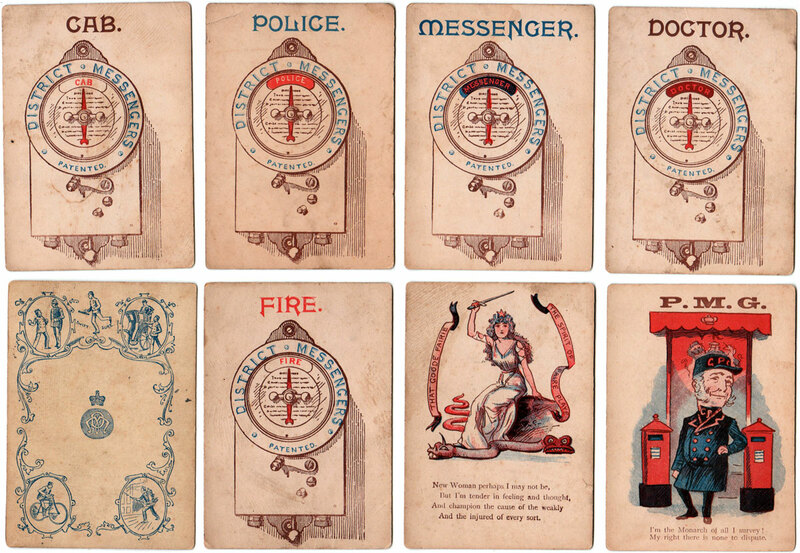 Above: “District Messenger” card game, early 1900s. Images courtesy Rex Pitts. 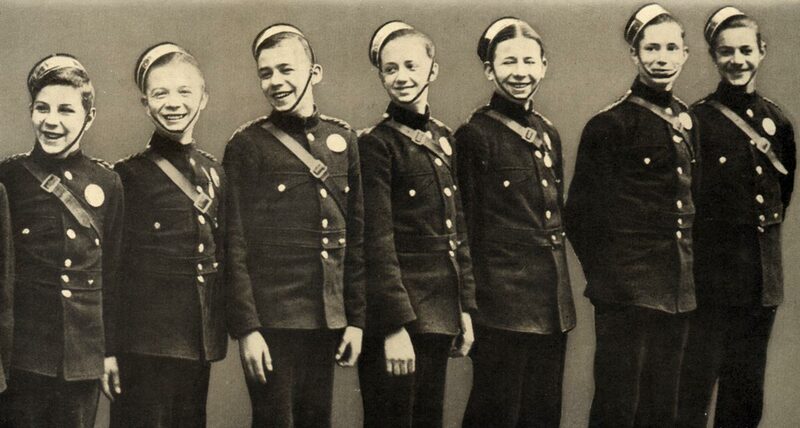 Above: District Messenger boys in the 1930s. 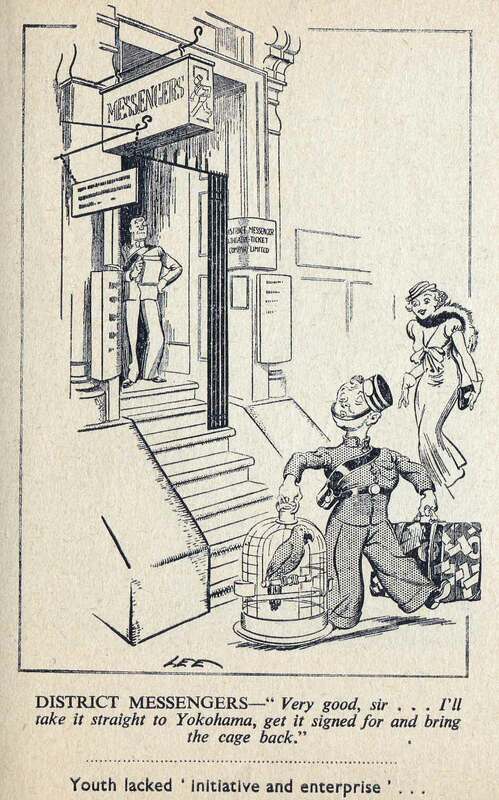 Above: cartoon in a book called “London Laughs” containing cartoons by “Lee” in the Evening News between 1934 and 1951. Courtesy Rex Pitts.